Ireland’s ‘growth beacon’ economy should mean tax cuts – not another tough budget, economist says. 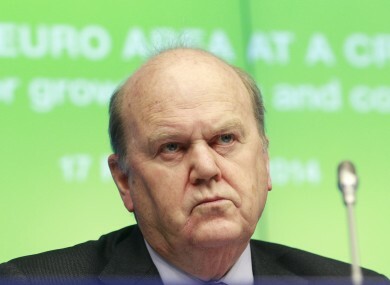 Finance Minister Michael Noonan has been warned against handing down another tough budget. THE IRISH GOVERNMENT has all the economic reassurance it should need to cut taxes in this month’s budget – particularly after the added sting of water charges. Goodbody Stockbrokers has sounded a warning note for the government if politicians were still thinking at all about spending cuts as it ramped up already-bullish growth predictions for the nation’s economy. It forecast the Irish economy, which it labelled “Europe’s growth beacon”, would grow 5.3% this year, mainly thanks to booming exports, imports and business investment. The prediction was well up on its earlier forecast of 3.5% GDP growth. Goodbody expects the economy to keep motoring ahead for the following two years, revising its predictions higher to 4% next year and 3.7% in 2016. The Central Statistics Office recently released economic growth figures for the year to June which showed Irish GDP had gone up 7.7% over the period. Goodbody chief economist Dermot O’Leary had a blunt message for the government two weeks out from its 2015 budget based on the buoyant forecasts. “Economic growth is going to do the job for the next 12 to 24 months – don’t try to choke off the recovery by implementing further austerity measures at this stage,” he told TheJournal.ie. O’Leary said Ireland’s combination of a high top tax rate – an effective 52% slug in the upper bracket – and the relatively low level it kicked in at could act as a “disincentive to work” as the jobs market picked up. He said warnings from groups like the Irish Fiscal Advisory Council, which recently called for another tight budget, were “unjustified” given the speed of the country’s economic growth. “The unemployment rate is still very high in Ireland at the moment and there is still a lot of spare capacity in the economy,” he said. Email “'Don't try to choke off the recovery with more austerity'”. Feedback on “'Don't try to choke off the recovery with more austerity'”.